They get a chance to show off some of their skills and compete against the top fishmongers from all across the UK – including those from fish processing companies, supermarkets and of course independent fishmongers. 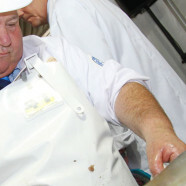 Up against over 68 competitors throughout the day, fishmongers compete in rounds for 12 different competitions. the overall highest total point scorer in a selected 5 of the most difficult of these becomes British Fish Craft Champion. As we always take pride in our skill as fishmongers, not just sellers, our teams years of practice and experience always help us to be at the top of the leader boards! Winning many awards over the years, our current team boasts both the 2010 and 2013 British Fish Craft Champions. In this years’ 2013 British Fish Craft Championship Ashton’s Fishmongers occupied three of the top four in the table, including overall winner of fishmongers in the UK, and our fourth and newest team member earning a second place in one of the individual competitions!